Ingredients: Beef, barley, rice, chicken meal, canola meal, oatmeal, beef fat (preserved with mixed tocopherols), natural flavor, sunflower oil, salt, calcium carbonate, potassium chloride, dried apple, monocalcium phosphate, dicalcium phosphate, choline chloride, vitamin E supplement, zinc sulfate, ferrous sulfate, manganese sulfate, niacin, vitamin A supplement, copper sulfate, calcium pantothenate, pyridoxine hydrochloride, vitamin B12 supplement, thiamine mononitrate, vitamin D3 supplement, riboflavin supplement, calcium iodate, menadione sodium bisulfite complex, folic acid, biotin, sodium selenite. 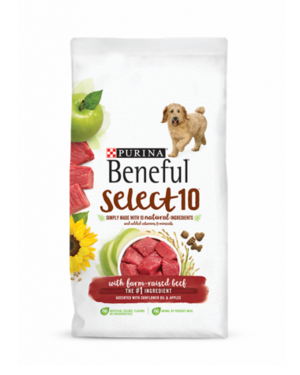 Beneful Select 10 With Farm-Raised Beef is formulated to meet the nutritional levels established by the AAFCO Dog Food Nutrient Profiles for the maintenance of adult dogs. We'll begin this review of Beneful Select 10 With Farm-Raised Beef with a detailed discussion of the ingredients. The second ingredient is barley. Barley is a nutritious carbohydrate source, naturally rich in dietary fiber and various minerals. Unlike pearled barley, regular barley contains the entire grain. The third ingredient is rice. Rice is a gluten-free carbohydrate source. As long as the bran and germ of the grain are intact, rice can provide a notable amount of fiber and nutrition. However, because the type of rice ("brown" or "white") is not specified, we cannot make this determination. The fourth ingredient is chicken meal. Chicken meal is produced by cooking chicken using a process called rendering. The rendering process dramatically reduces the natural moisture of chicken and thereby results in a highly condensed protein source. The fifth ingredient is canola meal. Canola meal is a high protein by-product of canola oil production. This ingredient is marked controversial because it may be derived from genetically modified rapeseed, which is associated with multiple adverse health affects. Because ingredients are listed in order of pre-cooked weight, the remaining ingredients in Beneful Select 10 With Farm-Raised Beef are not as important as the first five ingredients. Next we have oatmeal. Oatmeal is simply coarsely ground oats and therefore contains the entire oat grain. As with regular oats, oatmeal is rich in dietary fiber, B vitamins, and various minerals. The next ingredient is beef fat (preserved with mixed tocopherols). Fat is an important part of your dogs diet, beef fat in particular is a good source of essential fatty acids. 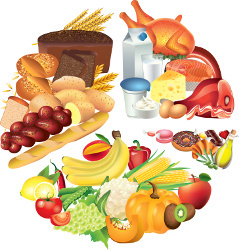 Then we have natural flavor, which enhances the flavor of the food. Moving on, we have sunflower oil. Sunflower oil is an omega-6 fatty acid source. Unlike other oils (flax, canola, etc), sunflower oil does not provide omega-3 fatty acids; However, the balancing omega-3 fatty acids are most likely supplied by another oil or fat source. The next ingredient in this review is calcium carbonate. Calcium carbonate is a naturally occurring mineral supplement. Although it's often used as a dietary calcium supplement, it can also be used as a preservative or color retainer. Our next ingredient is potassium chloride, which is a potassium supplement. dried apple is the next ingredient in this recipe. Dried apples are high in dietary fiber and provide a modest amount of vitamins and minerals. The remaining ingredients in this Beneful Select 10 recipe are unlikely to affect the overall rating of the product. The official PawDiet rating for Beneful Select 10 With Farm-Raised Beef is 3.0 out of 5.